More than a decade ago, a woman in her early 70s came to see neurologist Allan Levey for an evaluation. She was experiencing progressive memory decline and was there with her children. Part of the evaluation involved taking a family history. One of the woman’s sisters had died with dementia and an autopsy had confirmed Alzheimer’s disease. But it was the previous generation that captured Levey’s attention. Her father was one of nine children, and all had dementia. 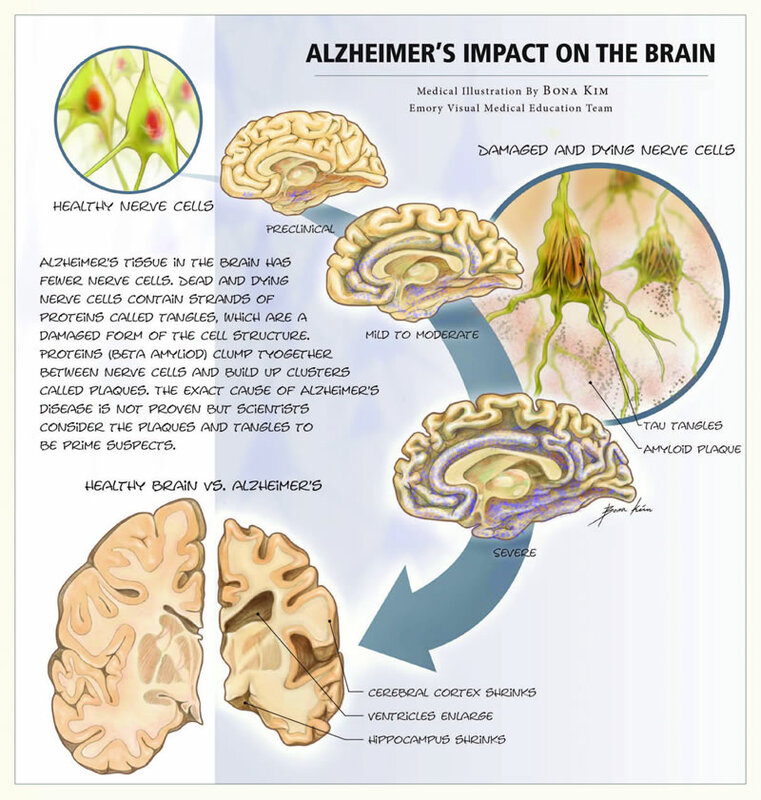 And three family members had had autopsies where Alzheimer’s was confirmed, says Levey, director of Emory’s Alzheimer’s Disease Research Center. The Lowman family (several members of whom can be seen in this old family photo, above) recalls touching moments from more than a decade of caring for their mother, Mildred “Lily” Chastain Lowman (right, in lawn chair), who died of Alzheimer’s disease at age 78. 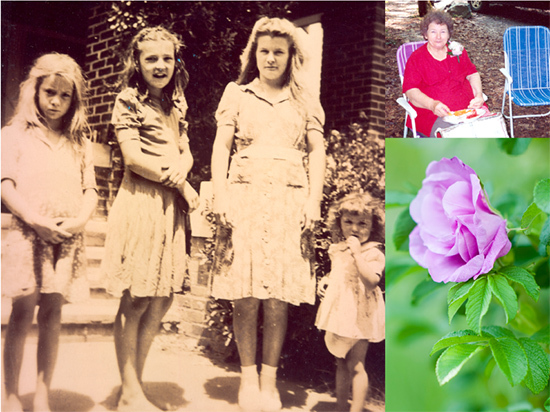 Her daughters say she loved the outdoors, gardening, and family, and carefully tended to her prize rosebush (above) that her daughter now maintains. Already, genetics was a hot topic in Alzheimer’s research. A major “susceptibility gene” variant—ApoE4—had been discovered that increased one’s risk but was not sufficiently strong to cause the disease by itself. For early-onset Alzheimer’s, which often strikes before age 60, even stronger genetic determinants had been discovered—three causal genes that were probably responsible for only a small number of cases, but which were autosomal dominant. If you had the gene, you would get the disease. Which may no longer be true. Members of the family working with Emory seem to have even higher than 50-50 odds of developing Alzheimer’s, which puzzled Levey. He began to think it was a new, extremely potent gene. “I’d never seen a family like this before or read about any described in the literature,” Levey says. Neurogeneticist Thomas Wingo (left) is searching for clues about genetic causation and risk in Alzheimer’s disease.Neurologist Allan Levey (right) is working with the family to try to determine why members have a higher incidence of Alzheimer’s. 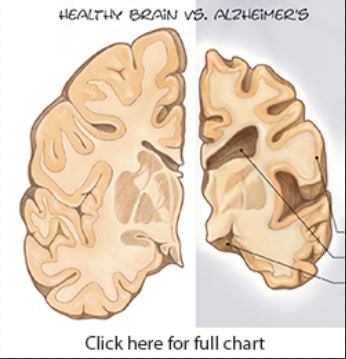 Additionally, family members tend to develop not early-onset Alzheimer’s but the much more common late-onset type, with symptoms emerging in their 60s and 70s. Genealogical research shows that members of the family share a common ancestor: French immigrant Pierre Jacob Chastain. Born near the farming village of Charost in the Centre region of France around 1660, Pierre Chastain and his family fled religious persecution, traveling through Switzerland, the Netherlands, and London, before sailing with a group of more than 200 Huguenot refugees for Virginia aboard the Mary and Ann, settling in Manakin on the James River in the summer of 1700. He was married three times and had 13 children, although several died before adulthood. Pierre Chastain died in Virginia in 1728 and was buried in a cemetery next to the family home. Through a stroke of luck, the Chastain lineage, now into its 10th to 12th generation in most family branches, has been well researched. The Chastain Family Association has 500 members, and a database of close to 40,000 individual records is available online. Natalie DiSantis, outreach director for the Alzheimer’s Disease Research Center, is the keeper of Emory’s version of the Chastain’s family tree. She started with the association’s website, piecing together missing links through obituaries, emails, and “someone telling me about their cousin in the Midwest.” DiSantis, who has a background as a health care attorney, has a huge folder stuffed to overflowing with Chastain family records. DiSantis has created a genealogical scroll more than 20 feet long listing 162 descendants that she has shared with the family, many of whom have supplied family photos to go along with the names on paper. After thinking it through, though, the sisters decided they should do everything in their power to help, including searching out other relatives, volunteering for medical tests, and inviting Emory researchers to family reunions. When their mother died in 2008 of Alzheimer’s disease at age 78, it only made the sisters more committed to the cause. They regularly make the drive from their homes in North Georgia to Emory’s Brain Health Center at Executive Park to have their blood drawn and take cognitive tests. Some even consented to spinal taps so researchers could search for early biomarkers of Alzheimer’s disease in their cerebrospinal fluid (such as levels of beta-amyloids and tau proteins, which are associated with the plaques and tangles that damage the brain). Lily Lowman was an amazing mother, they say, gentle and nurturing, a midwife and healer who gathered herbs for remedies and had a curious mind and an adventurous spirit. 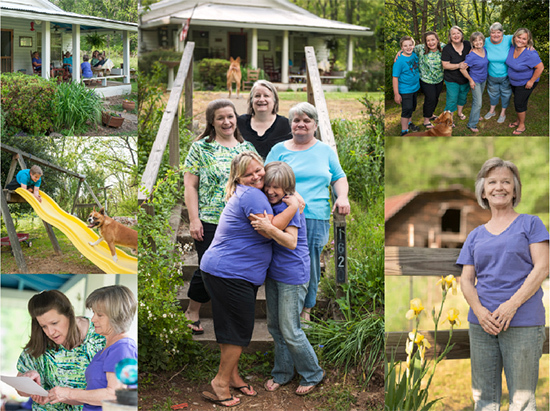 She raised her six children, four girls and two boys, in the country down a dirt road at the “old home place” in Ellijay, where she would take them on picnics during warm summer months, packing a lunch, picking flowers, and staying outside all day long. Lowman first started to show signs of dementia in her late 60s, repeating questions that had just been answered, hiding things in strange places, calling her daughters by the wrong names, not recognizing visitors she normally would. Always gentle and kind, she retained her sweet spirit but sometimes grew uncharacteristically agitated. For instance, their mother would often worry that she needed to go “home,” that her own mother and father (who in reality had died many years before) were waiting for her. So they would take her for a ride around the block in the car and return to the house. Or they would tell her, “Your mama and daddy called and said they were going to church and that you can stay with us a while longer,” Lee says. One time, their mother thought there was a little girl at the foot of her bed and she wouldn’t be consoled until they set up a bed in her room for the girl. “She’s sleeping sound as a baby, she must have been so tired,” said their mother, before drifting off herself. When Lowman grew restless in the evenings, they would take her to Wendy’s to get a Frosty as a distraction. “We did whatever we needed to do to relieve her mind,” says Lee. Tammy Bigham, Lee’s daughter and a certified nursing assistant who works in hospice care, says her mother used to sleep beside her grandmother’s hospital bed on a blue-and-white reclining lawn chair. “She’d do that night after night and then get up and go to work at the blue jean plant that used to be in Jasper,” she says. While there were light moments, Bigham says, it’s hard to accept that her own mother, or she herself, might face the same fate. “It’s scary, for both of us,” she says. “Mama does Sudoku puzzles and crosswords and takes vitamins and herbs to help to better her brain function. She says if she gets it she would put herself in a nursing home, that she doesn’t want me taking care of her like she did her mama. That hurt. I felt like she was taking that away from me. She’s always the first one to help anyone else, to make sacrifices, and it would be an honor to take care of her. As word has spread, Chastain family members have stepped forward from North Georgia, Alabama, and the Carolinas to help with the research efforts. So many have participated in Emory’s studies—close to 200 so far, with about 100 being actively monitored—that it has become nearly a family pastime. At reunions and gatherings, there’s often good Southern food like ribs, slaw, and sweet tea, lots of catching up among the grandchildren and cousins, and a visiting research team. “We do brief cognitive testing and a blood draw. We always couple research with education and explain how the samples will be used,” says Cecelia Manzanares, associate director of research projects with Emory’s neurology department. Many Chastain family members have become part of Emory’s Alzheimer’s Disease Research Center registry, coming in every year or two to do follow-up cognitive testing, get a physical, and gain a sense of how they are progressing as they age. “We’ve been following some members for quite a while,” Manzanares says. Wingo believes that Alzheimer’s disease is due to hundreds of thousands of causes, like Lego building blocks, all interconnected—a confluence of factors. But he also believes that there are certain causes that confer more risk than others and that families such as this contain valuable clues about genetic causation and risk. His research involves analyzing sequences of genetic information with high-performance computers that can handle enormous amounts of data. Genetic data collected from family members is much more meaningful than data collected from strangers, because you can make predictions about what they should share genetically. 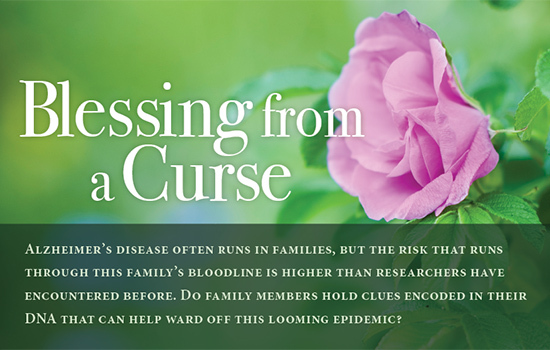 These predictions are then used to help understand whether genetic variants are present due to chance alone or associated with a disease in the family. Since people share half their genetic materials with their siblings, on average, and half with their parents, inherited patterns and genetic variants become illuminated through the generations. Regardless of whether the exact causative genes can be discovered, there is great research value in studying families whose members develop Alzheimer’s at higher rates than average. Researchers can track brain changes and biomarkers, conduct longitudinal cognitive testing, and perform clinical trials to test medications and therapies that might slow or halt Alzheimer’s onset in presymptomatic carriers. Dorothy Hightower (above, left) points to her name on a Chastain genealogical scroll. Her daughter, phlebotomist Virginia Rutledge (above, right), takes a blood sample from another descendant to be sent to Emory from her clinic in Ellijay. Phlebotomist Virginia Rutledge, who is 10 generations removed from Pierre Chastain, regularly opens her medical screening clinic in Ellijay, Georgia, to any family members willing to donate blood so they don’t have to drive to Atlanta. She offers a full blood chemistry panel as incentive. Dorothy Hightower, Rutledge’s mother, helps her at the clinic. She guesses there are about 100 of her relations in nearby Pickens and Gilmer counties alone. Maxwell’s son, known as a preacher’s preacher, established churches in the area. Hightower remembers hearing that when he was an old man and a bit senile, he and his wife were sitting on their porch and he told her that God was calling him home. “Then he leaned up against the porch post, looked out, and said, ‘What a bad cloud this is.’ He died that night.” One could forgive him his forebodings—all 10 of his siblings died of what the family now suspects was Alzheimer’s. Hightower’s father died from the disease, and other relatives have it as well. As with the Lowman sisters, this has made her and her daughter even more motivated to help, and they have taken over recruitment for Emory researchers, reaching out through the family grapevine, social media, and newspaper and television coverage. “This family sees very clearly what is happening and is motivated to help us discover what causes the disease,” says Levey. “We owe them a large debt, one I hope we will be able to repay someday. Too young for a tricycle?